Whilst wearing our Krissy gown you will radiate a Romantic and ethereal essence. 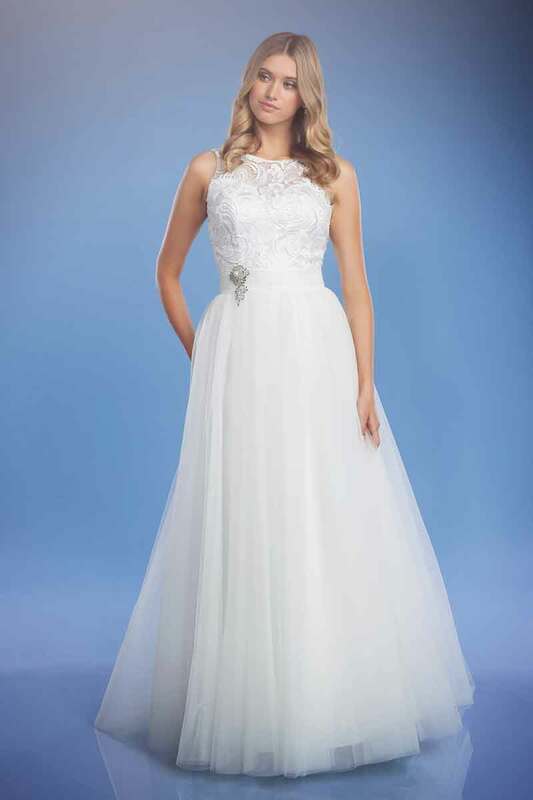 With a soft tulle skirt and intricate design lace bodice it personifies a timeless grace. One of the many white wedding dresses in our Melbourne shop. A guipure lace bodice commands attention on the Krissy. Featuring a boned bodice cascading into a soft flowing tulle skirt with a tulle train. This chic dress is available in white or Ivory. Exclusive to Leah S Designs. 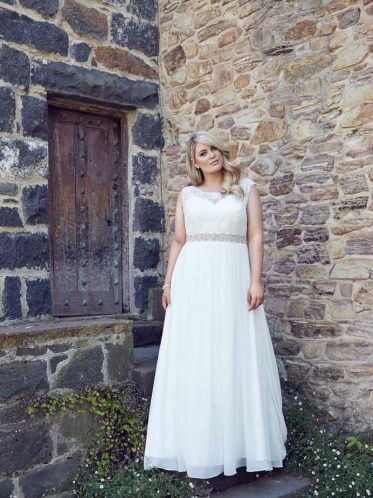 Affordable designer wedding dresses like the Krissy are all designed in our Hallam store. We picked out a vintage style lace for the bodice and with an on trend key hole back feature so all angles have an interesting point of detail. Usually 2 to 3 fittings will be needed, done 4 to 5 weeks before your wedding with your shoes and bra. Our dressmaker will have a look at how your dress fits and what needs to be done. . Accessories for white wedding dresses. Our model is wearing a vintage style brooch as a feature on the side of the dress. Chosen from our extensive range of wedding jewellery. would look gorgeous with the flirtatious earrings and Emma hair comb. Maybe a family brooch. Don’t forget to check out our wedding shoes to match our white wedding dresses while you are there. A knee length tulle bridesmaid dress would be a lovely choice for bridesmaid dresses to compliment the krissy dress, most of all soft pastel colours are very popular at the moment. 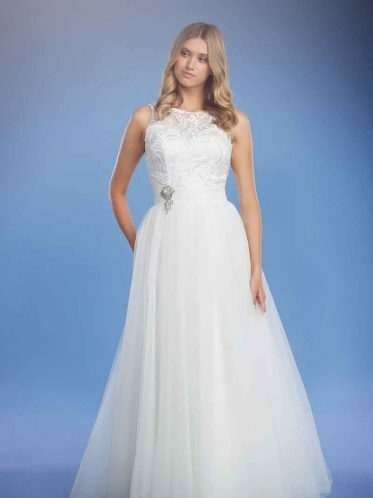 The Krissy Bridal Gown is available in sizes 6 to 16. Priced at under AU$800. Check out the history of the white wedding here. Also check out our wedding dress accessories, designer wedding dresses, deb dresses for sale, wedding bags and wedding shoes Melbourne.